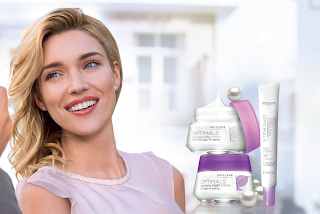 Capture your flawless look… with Optimals Skin Youth Day, Night and Eye Creams. Ideal for women 30+ who want to address their first signs of ageing; fine lines, enlarged pores and skin dullness. Replaces Optimals Time Relax. • Light-reflecting microspheres – small light-reflecting particles designed to smooth your complexion from day 1, helping to improve fine lines and pores and to make imperfections invisible. • SPF10 (Day Cream) – protects your skin against photo ageing. Resulting in youthful-looking, flawless skin, with noticeable improvement of first lines, enlarged pores, dry patches and skin dullness.